Bill Hutchison discovered that cats were a major source of human infection with the parasitic protozoa called Toxoplasma, the causative agent of toxoplasmosis which is a widespread disease of man and all warm-blooded animals. About 30% of the world's population is infected by the Toxoplasma parasite but in most people the infection appears to be asymptomatic and the parasite remains as a small cyst in the brain and muscle. However, if the infected person is immunosuppressed by pregnancy or diseases such as HIV/AIDS, the Toxoplasma infection can have serious consequences. In sheep and goats throughout the world it is an important cause of abortion. From the early part of the 20th century, it was known that people could become infected from eating under-cooked or raw meat from an infected animal. However, it was not known how herbivores or vegetarians became infected. 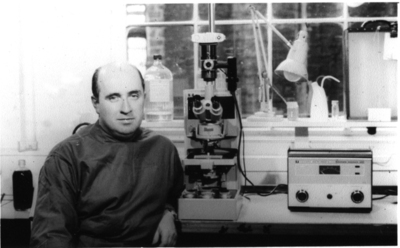 Pioneering work by William Hutchison in 1965 showed that the domestic cat was an important vector of the disease by passing the parasite in its faeces. Furthermore, he showed that the parasite (in the form of oocysts) could survive in the environment for up to one year. "The only living material observed, apart from bacteria, were the oocysts of Isospora and the ova of T. cati." This discovery had universal health implications. Because there are no drugs which are effective against the tissue forms (cysts) of the parasite his findings led to a series of recommended public health measures. These were aimed at creating greater public awareness of the problem and advising people to reduce contact with cat faeces, especially if they are pregnant women or people infected with immunosuppressive illnesses. 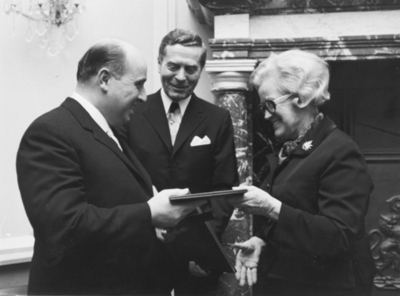 In 1970, Hutchison was awarded the Robert Koch medal, the first British Scientist to receive this award. Born 2 July 1924, Glasgow, Scotland. William (Bill) McPhee Hutchison (1924-1998) was a Glasgow graduate who became a parasitologist and discovered that cats are the source of the Toxoplasma parasite infection in humans. Born in Glasgow in 1924 he was educated at Eastwood Secondary. 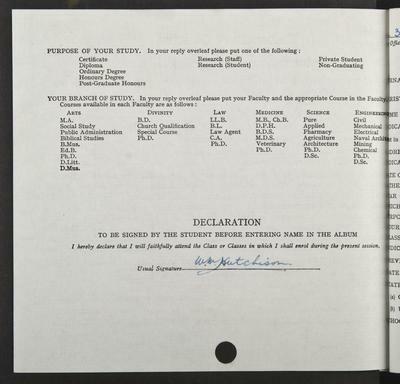 He obtained his Certificate of Fitness for University in 1943, but war delayed his plans. 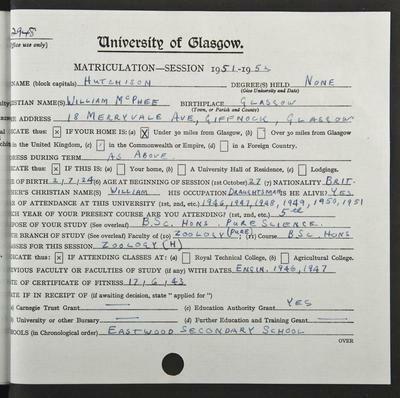 After serving in the Fleet Air Arm he returned to continue his education at the University of Glasgow, where he began with a curriculum in Engineering in 1946 before deciding to study Zoology. As well as achieving academically, he was an accomplished sportsman, receiving a University Fencing Blue in 1949 and winning the Scottish Fencing Club's Ford Cup. He graduated with an Honours BSc in Zoology in 1952 and went on to research intestinal helminths of the cat for a PhD, which was awarded in 1959. Thereafter he took up a lecturing post in Strathclyde University. In 1970, he was awarded the Robert Koch Medal for his research in Toxoplasmosis. He was the first British scientist to receive this award and in recognition of this, he was appointed Personal Professor by Strathclyde University in 1971. In that year they also awarded him a DSc and he remained there for the rest of his career. He died on 28 December 1998. Barrett, M. P., E.A. Innes and F.E.G. Cox. 1996. The Scottish Encounter with Tropical Disease. University of Glasgow: Wellcome Centre for Molecular Parasitology. Hutchison, W. M., J. F. Dunachie, J. C. Siim and K. Work. 1969. Life cycle of Toxoplasma gondii. British Medical Journal. iv: 806. Hutchison, W. M., J. F. Dunachie, J. C. Siim and K. Work. 1970. Coccidian-like nature of Toxoplasma gondii. British Medical Journal. i:142-144. World Changing Project, "Preventing the spread of the parasitic disease Toxoplasmosis," in University of Glasgow World Changing (University of Glasgow, 2010); http://www.worldchanging.glasgow.ac.uk/article/?id=73 (accessed April 26, 2019). World Changing Project. "Preventing the spread of the parasitic disease Toxoplasmosis." In University of Glasgow World Changing. University of Glasgow, 2010. http://www.worldchanging.glasgow.ac.uk/article/?id=73 (accessed April 26, 2019). World Changing Project. "Preventing the spread of the parasitic disease Toxoplasmosis." University of Glasgow World Changing. University of Glasgow, 2010. 26 April 2019 <http://www.worldchanging.glasgow.ac.uk/article/?id=73>.